2012 comes to an end but your kitchen is definitely revamped. This year brought a series of colorful, fun, quirky and easy-to-use kitchenware you may or may not need. But admittedly those can make your life simpler, give your kitchen a sleeker look and often help you be environmental friendly. Re-Pac Bags are the eco-friendly, food-safe bag alternative to disposable plastic baggies. Pack your lunch, tasty snacks, sandwiches or pieces of fruit and you are ready to go. Those stain, leak and mold resistant bags are also hand-sewn; they are perfect for your daily on-the-go snack or when traveling. Kids will love it as well as adults. Prices start at $5.95. Blogger's Note: Tested. Easy to pack and clean but I often felt that those nice bags are for my cosmetics rather than peanuts! This inventive item introduces an easily adaptable and creative concept to any kitchen or dining setting. FreeForm takes the form of both a tray when lifted by the cut out handles and a placemat when lying flat. It is available in numerous contrasting colors with smart stitched detail edging. Prices vary from $19.99 to $29.99. Tilt is a new word to the chilled drinks and the newest addition to your cocktail set. 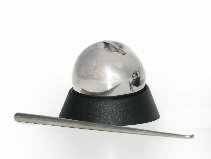 The chilling sphere is iceless and flavorless so it does not interfere with drinks and their flavor. All you have to do is to store tilt in the freezer a few hours before your cocktail time, then insert it in your wine glass, cocktail or a party dip to keep it chilled. Tilt is center-weighted so it will always sit up-right and is easily removed by an included retrieval hook. It comes with a silicone freezer stand. Prices start at $17.99 for the single and $34.99 for the twin tilt. Blogger's note: Tested. It chills your drinks but the ball looks strange in the glass. Easier to use than ice cubes. BellaVita’s new freezable, insulated Chill It bags are perfect for keeping wine, beer or sodas cool on the go! Keep those bags in the freezer and they become instant coolers for whatever you want to chill. 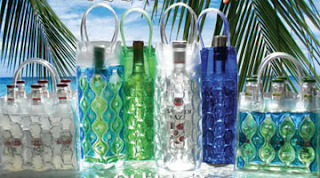 They come in six different bright colors and in three designs: square, cylinders or totes. Bella Vita Chill It bags are reusable and perfect for gifts. Prices start at $9.95. Blogger's note: not tested yet. If you don’t like big salad spoons for your salad or pasta servings, try Snapi. This single handed server allows easy serving of salad, pasta, fruit and everything else that comes in a bowl! This kitchen item is ergonomic and colorful. Grab a full serving without putting your plate down. Blogger's note: Tested. Use rather in a large bowl when there is plenty of salad to grab. Give your veggies a makeover but putting them in this new microwave cooking bag. Forget about plastic containers that may melt or any other ceramic plate that becomes too hot after a few minutes in the oven. The Corn-n-Tater is said to cook your food without loss of flavor as it is made with a blend of cotton and bamboo materials. It is easy to clean: machine wash and air dry. Good for vegetables but also pizzas, tortillas, bread and frozen foods. It comes in various designs; each pack contains a recipe booklet. It will cost you $12.99. Blogger's note: Not tested yet but sounds intriguing.